It has been almost a year since Daddy went to live in heaven and oh, the new mischief heaven must have going on with him there. I think of all the saints he has greeted since then, some have been his friends in the last year from church. And the famous people…I wonder if Daddy was involved in the planning of Elizabeth Taylor’s welcome to heaven party. Anyway, I have been thinking about him alot lately. More so than usual. Earnie happened to share with me that she’d been thinking about Daddy alot and I told her I had too. We got to thinking it was because he was probably doing something big in heaven like planning a festival or parade. Then, last night on the way home, we saw the Moon. A big, fat glorious Moon. 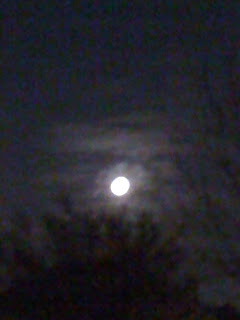 Look back at my blog entry on March 19 from 2011 and you’ll see that Daddy passed away on the day of the Perigree Moon. Ever since that night our family looks into the sky to “visit” with Daddy. It has been our constant sign that he’s always with us. When I go out in the evenings to take Ruthie the wienerful for her nightly constitutional, there Daddy is. Big as life, shining down. While I miss him dearly, I wouldn’t trade his Moon for anything.